This is a rather distinctively shaped durian with 5 sides, like a starfruit (carambola). 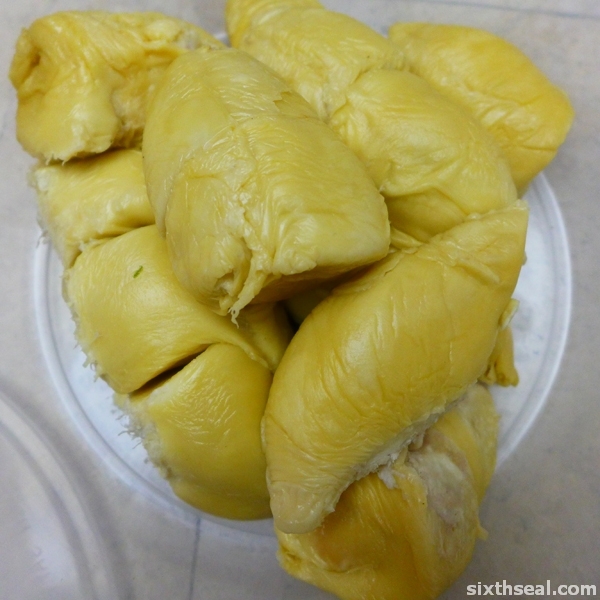 The seller told me it’s called “Five Star Durian”, he translated it from “mm zhi gor” (five seed fruit?). I found it rather intriguing and wanted to buy it but unfortunately it’s not for sale coz it’s unripe. I was told it’s popular in Gopeng, Perak. It’s a huge one, this durian – 4-6 kilograms. I got some XO durians instead. It’s the end of the season for XO. I opened 3, and bought two. You can actually return durians you don’t like it after it’s opened. I found one too dry and replaced it. I was a little dubious about the third one and was asked to taste it. Free tastes are common and even if it doesn’t go into the scales, they don’t actually lose from it. 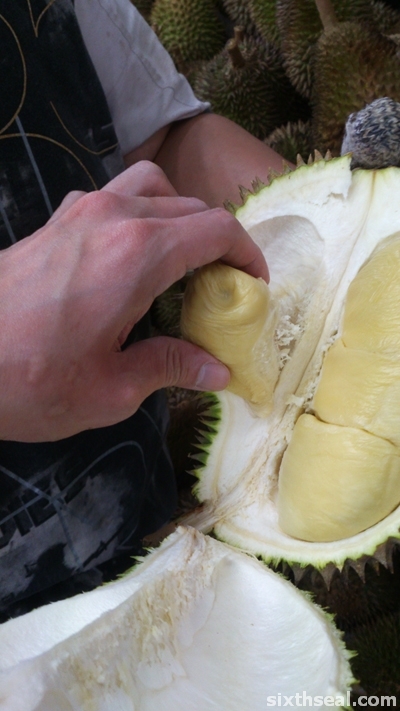 Durian flesh is very light compared to the husk, which is the heavy part. of the durian. XO durians are bitter and it’s one of my default buys. It has loose flesh that slides right off the seed – it’s runny and creamy with medium large seeds and little fiber. There is said to be an “alcoholic smell” to XO durians. That’s not right, it shouldn’t smell like ethanol, that would indicate fermentation (meaning it’s rotting). It’s more like an aftertaste – it just stays put on a bit longer, a mild alcohol-like lingering note. Note that this is from an ex-alcoholic with no problems with drinking neat 40% spirits straight from the bottle so my description on this may deviate (quite) far from the norm of the population bell curve especially those who thinks Islay single malts are horrendous. I was quoted RM 12 / kg as the end of season price (as opposed to RM 8 / kg last week) – asked for RM 10 / kg and got it. I bought 2 durians for 3.2 kilograms total. It got rounded up to 3 kgs so that’s RM 30 for a few pieces. 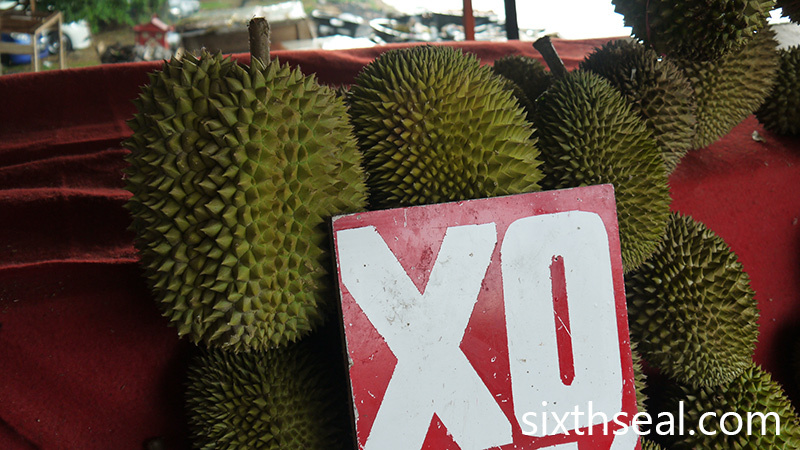 XO is one of the more expensive durian clones. It’s good though. It’s very bitter and there’s really nothing mystical about this – it’s named XO (after the extra old designation for cognac) but it’s not alcoholic (unless you ferment it). I can best describe it as you having a BITTER aftertaste in your mouth at the back of your tongue even hours after eating it. Gee! You ARE feasting on durians, aren’t you? Still in season here, and going quite cheaply too…for once. Dabai too but that’s dwindling – wouldn’t last much longer, I think. Good to hear that! I hope that I can still catch the tail end of the season when I come back for CNY. Ah…dabai, I’ve missed that so much, haven’t seen that here. wah you on durian marathon ar? haha. i prefer bitter durian, y penang no have XO durian! I’m pretty sure Penang has XO but the emphasis would be on Northern durians such as Red Prawn (Ang Heh) which is native to Penang. We can get Red Prawn durians here too but not the original ones (not from Penang, domestic consumption too much) but from Pahang. 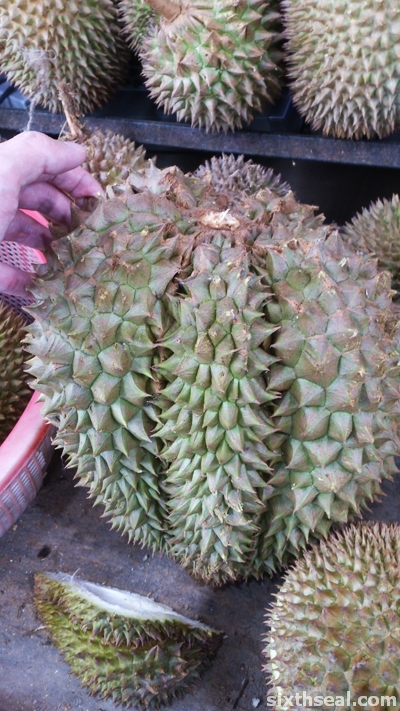 It’s also reddish in color but somehow the cloning or cultivar process made it into a starfruit shaped durian (much like the one pictured here, but different durian, not sure how to explain it). Nice! Durian kahwin, now that would be a project to find here. Durians still in season then I see? Not a fan of uber-bitter durians like the XO. Personal favorite of mine is known as the “Golden Pillow” or “kim jim tau” in hokkien though I’m partial to more common strains like D24, D101, Musang King or Bamboo-Foot. I find it hard to find durians with that in-between taste – not cloyingly sickly sweet but neither mouth puckering bitter. Yup, it’s pretty much in season the entire year nowadays due to different orchards growing different cultivars/clones at different times so it fruits throughout the year. However, the major peak season starts in July, durian season in Sarawak is much later than the ones here, usually towards the end of the year. Nice! I like Bamboo Foot too, that’s good one but not a huge fan of D24 generally. MSK is alright although it’s kinda wet nowadays due to the rainy season. I’m partial to bitter to bittersweet ones but if you’re looking for the exact right-down-the-middle taste profile, that can be a bit challenging unless you try ones you like e.g. Golden Pillow from different orchards at different times. I’m not an expert in any way in choosing durians, but I like exploring the different cultivars and orchards and seasons and see how it affects taste etc. Hmm…if you like sweet ones, there are a lot of classical sweet durian cultivars around, but you can also find out what you really like by other characteristics e.g. 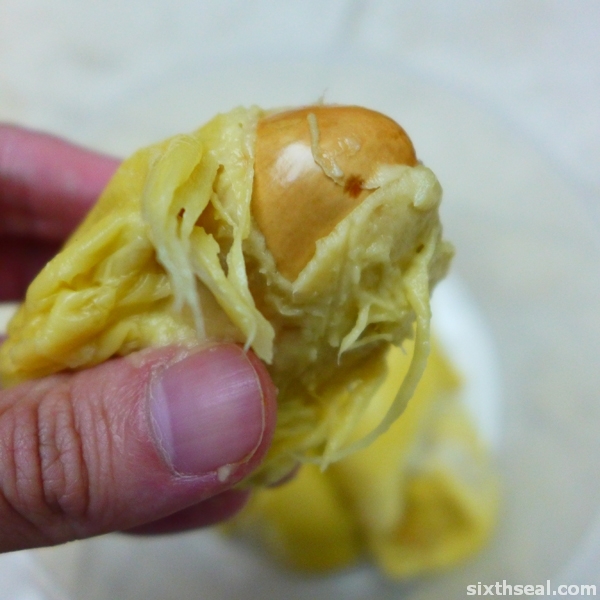 fiber (little fiber will produce a creamy durian) or soggy vs dry durians. These are ‘on steroids’ durian. Seen before. 1 can be as heavy as 30kg. Yeah buddy, I saw it on your Facebook. Thanks for messaging me, that is an interesting find indeed. 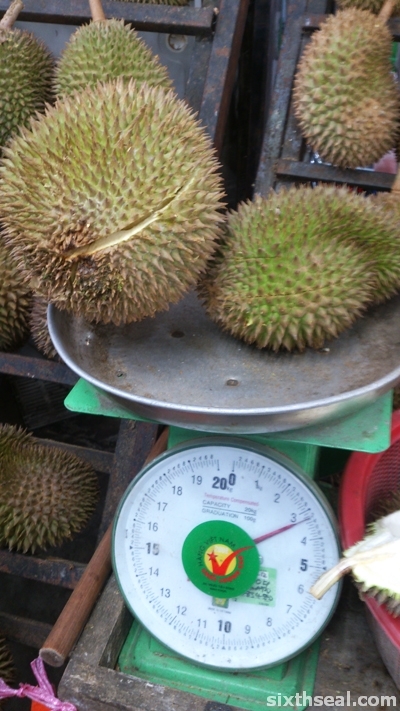 Gigantic durians. I’m wondering where they’re from, would love to try them. I know some durians never even make it locally and gets sent straight to Singapore especially the boutique cultivars with a small output. No worries, you can have durians almost every year round but the major season here just starts in July or so. However, you still can get off-season durians, it just tastes different, not bad, just different. I remember having some of those star shaped durians before as a kid. Don’t remember how it tasted though. Haha. Nice! I bought a couple of star shaped durians too – not these ones, it’s a Pahang Red Prawn (original cultivar is from Penang, they took it over and planted it there). I don’t know if there’s cross-breeding or cloning but it turns out to be five sided. Tastes pretty much like Penang Red Prawn though, inside the flesh is similar, but not as good as Balik Papan Red Prawn durian. Hey Huai Bin, where do you buy this durians? It seems very awesome and you tried a lot of types of durians. 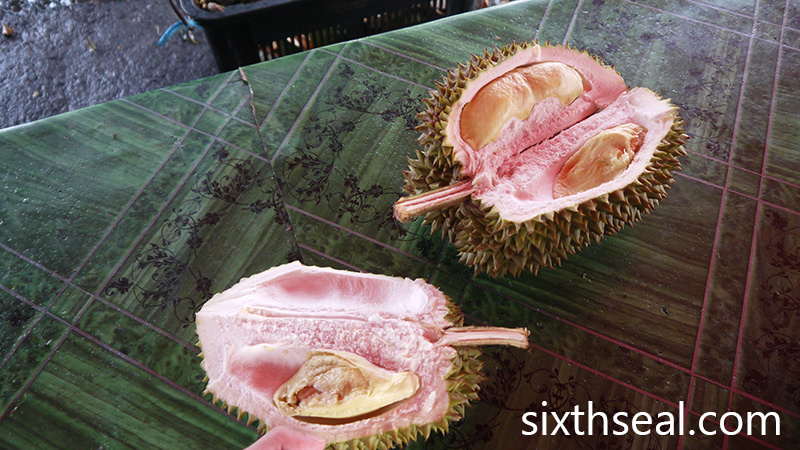 Have you heard of durian that has red meat? I bought it in SS2 – I’ll recommend the corner shop (SS2durian.com) and Pahang durians, but it depends on the worker actually. Some of the shops there have really bad service while some has really good service and some has good and bad days. I suggest getting to know them. I’ve had bad experiences with Donald’s so I try to avoid that, but your mileage may vary. Heh! Yeah, I’m mad about durians right now. Totally in a durian phase, there’s always durians at home, no kidding. DAMMMMMMITTT. How I miss durians. My family doesnt eat ’em thus I dont get the chance to eat any haha! You can always head out and eat them with friends, that’s what I do since my family isn’t here. My dad eats durians though, and so does my mom so I grew up eating durians. We’ll get heaps during the peak season (now in Sarawak) and it’s really cheap, but most are from Indonesia and there are gems in there. Cultivars are not sold as such in Sarawak (you can get them, but they don’t brand it like over here) so if you find a good seller, that’s gold. I’m always up for durians. Haha! Why do you like to see people eat durians? You’ll have some too right? Buzz me when you want to go. May I know when good season ? How to locate you to buy some quality durian ?